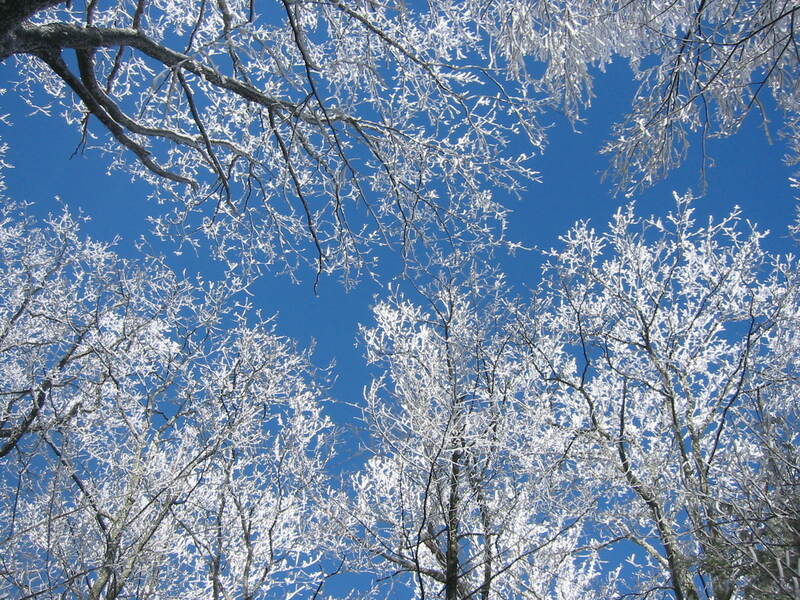 This is a recap of some cold weather, multi-day ventures into the Southern wilderness. These trips took place during the winter months of January and February, and were planned with the intention of finding some snow – which is not always easy in the South. The tradition began in the late 90’s and continues on through today. While these are the “official” Klondike hikes – there were times when we had epic snow events within a few weeks of these backpacking trips. So to give honorable mention to these storms, you’ll find a few links embedded within the Klondike hikes. Noteable Events: With a 100% chance of rain to the north, we pull an audible and head for Augusta – the only dry area within striking distance of both Atlanta and Charlotte. A ranger with the US Army Corps tips us off on an unpublished campsite at Bussey Point – surrounded on three sides by Strom Thurmond Lake. We hike six miles to the site and appreciate its amenities – shelter, picnic tables, firepit (with staked firewood), bear pole, and privy. While nearly everything north of us gets soaked with rain, we register only a drop or two at the lake. The next morning our streak continues and we hike out with no precipitation – with the last of our group arriving back at the trailhead by noon. Noteable Events: Roger and I enjoy the accommodations and free breakfast at the Waynesville Inn on Friday morning then drive the short distance to Cherokee to meet the rest of the group. By 2:30pm, we hike 5.1 miles in light snow on the Newton Bald trail to Campsite #52, but are met with a wind chill of -4 degrees at 5000′. This prompts a mad dash for firewood and herculean effort to hang the Kelty tarp for wind cover. Roger & Pratt bring the fire to life outside the cylinder and there is much happiness. Beverages are consumed, cigars are smoked, and we celebrate that we are no longer going to die from hypothermia. Roger sacks out early, and leaves a surplus of beer. So we brave the temps until after midnight committed to finishing it off. On Saturday morning, we hike drop 5.2 miles and 2800′ feet off the bald and punish our 40+ year old knees on the decent. Most of the group head for Cherokee, get cleaned up, then walk to the Harrah’s casino for drinks, dinner, and some gambling. There is a country music show tonight and the casino is mobbed with cowboys & cowgirls. Pratt manages to find room at a $25 table and for the second year in a row cleans up – beating his haul from last year. Noteable Events: Most of the crew spend Friday night at the Fairfield Inn which is conveniently located across from the Harrahs casino in Cherokee. Much gambling ensues. Pratt hits the tables until 3am and banks a cool $1400. Hangovers linger the following morning and we hike in to Campsite #74 via the “Tunnel To Nowhere”. A young Clemson couple shares our campsite with their dog which they didn’t realize was illegal in the park. We explore the banks of the lake that are significantly down for the winter and enjoy beach combing and finding many flip-flops, beer cans, and half used bottles of KY. Charlie locates a large plastic chair and puts it to service around the campfire – while Roger consumes large quantities of ginger beer/whiskey and entertains our Clemson guests. Charlie joins them in plotting revenge against Bunting’s beloved Alabama after losing the NCAA football championship back in January. Noteable Events: We leverage 4×4 trucks to access the Appalachian Trail at Blue Ridge Gap and hike northbound to the Georgia/North Carolina state line to camp at Bly Gap. This is the inaugural backcountry run for the GoPro – a gift over the Holidays. Thorton sniffs out some beef jerky in my backpack and eats a softball size hole in my Gregory. Meanwhile, Pratt goes old school on the fire – starting it with only matches and sliced up kindling. 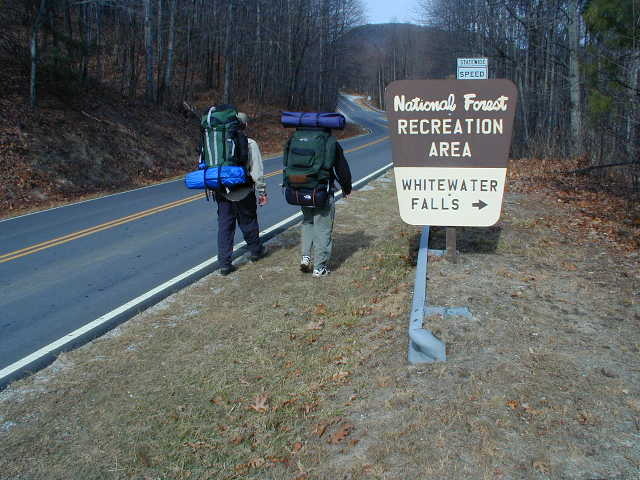 We see a surprising number of people on the trail for a mid-winter hike at both Blue Ridge Gap and on the A.T.: 50+ yr motorcyclists, 40+ yr cyclists, and a number of day hikers and other backpackers. On Sunday, we pack up quickly and return home to watch the Patriots edge out a victory over the Seahawks in the Super Bowl. 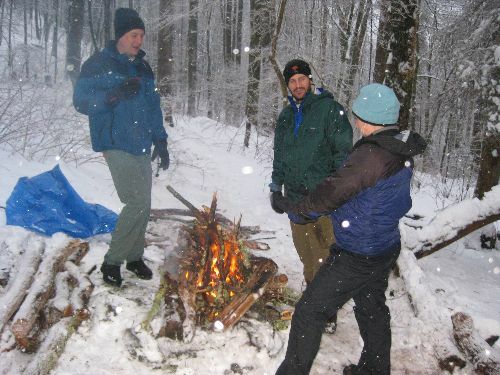 Noteable Events: Two days of rain yield to snow then sunny skies for the final 18 hours of the annual MLK hike. For many in the group, this is a re-do of a route that we hiked in 2008. Brunn and Goodrich meet up with the crew on night #2 at Ice Water Springs Shelter and hike in from Newfound Gap in the twilight hours with 18 beers and 2 bottles of liquor. The Boyz are pleased and much comaraderie ensues. Day 2 begins with a spectacular sunrise and bobcat tracks surrounding the shelter. We hike ~12 miles down to Smokemont Campground thanks to McKinney who walks out to Newfound Gap and shuttles a car. There is heavy ice at 5900 feet but the temps warm during the day and there is no snow below 5000 feet. This makes for a pleasant afternoon on the trail. JD leads a little-known side-hike near Charlie’s Bunion that has solid (albeit frigid) 360 views of the park. Noteable Events: The weather is unseasonably warm in the Smokies with temps on the ridges in the 60’s at 4800+ feet. Phillip and I meet the crew at Cosby Knob Shelter and I promptly lose my wedding ring while cutting firewood – the second time on a backpacking trip in less than ten years. The hike (for the rest of the group) is a repeat of a 2004 route that is followed in honor of Jeff Nausse who is lost at midnight the previous summer on Lake Lanier. This trip is planned nearly a year to the day of our last trip with Jeff. 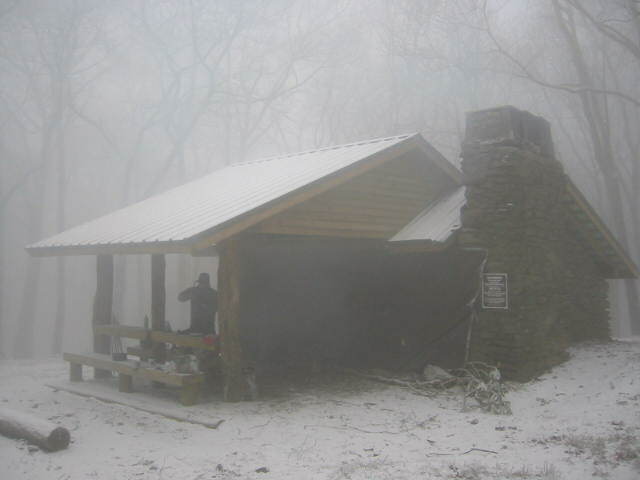 Ironically, a hiker dies from exposure at Tri-Corner Knob shelter only a few miles from our campsite at Cosby Knob. He starts his hike the same day I do and JD is called for information by a NPS Ranger as part of the recovery effort. A few weeks later we venture out on the A.T. again but this time end up in a snowstorm and 8 1/2 inches of snow – a true Klondike hike. Noteable Events: It rains most of the morning which sends Bracy, McKinney, Moehlick, and Nause hitching in to town to get lunch and a 12-pack. Brunn bails on the trip and I end up riding to Newfound Gap with Ken “The Weasel” Knight. 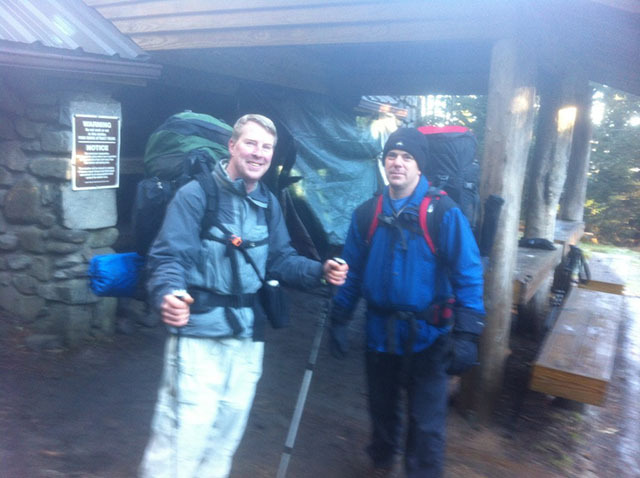 Roger ” The Camel” Cardoe meets us at Newfound Gap and we arrive to find a few of Porter’s crew already present at Mt. Collins Shelter. The rain stops in time for our hike but our attempts to get a fire going are futile – the first time I’ve seen Roger shut down on fire building in the backcountry. Noteable Events: We set-up camp on Eastatoe Creek then hike a short distance to the Narrows to check out the waterfall. Roger stokes up his trademark fire and promptly blows out my Thermarest. This is the second of two winter trips that we do this season. 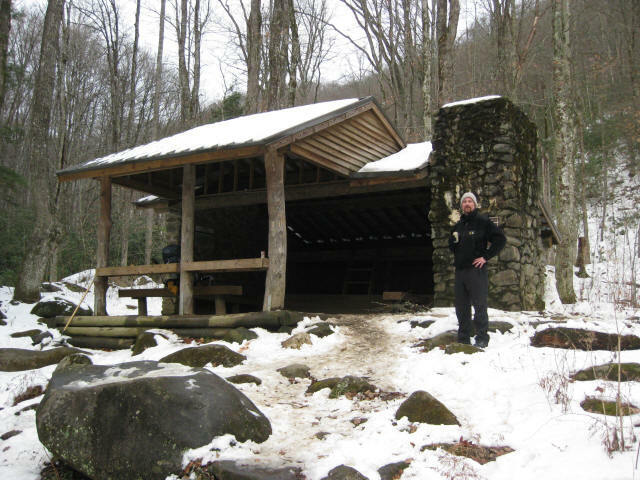 Click to the Kephart Shelter hike for a Smokies backpacking trip that we took two months earlier that put us well in to the snow. 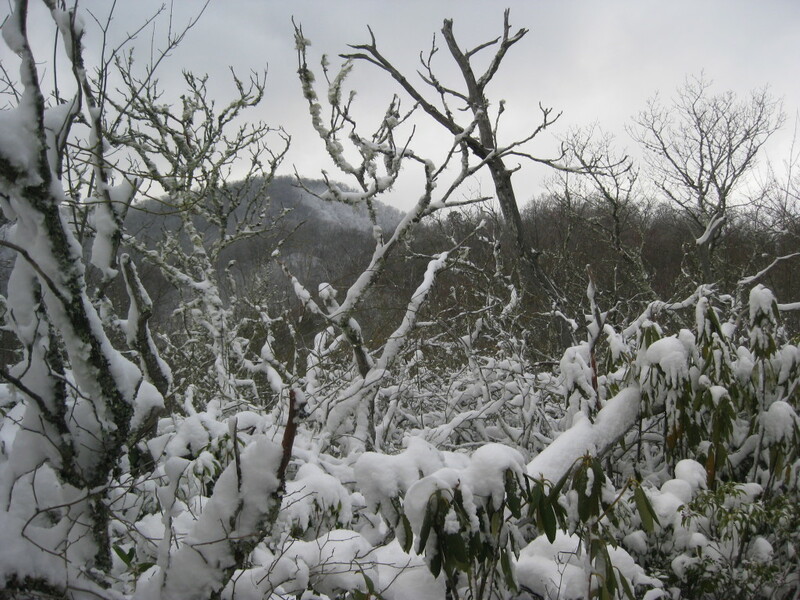 Noteable Events: A blizzard rolls through Western North Carolina and forces us to call about three audibles on our hike this weekend. We end up heading for Standing Indian but are stopped by a closed Forest Service gate and hike a short distance in to a shelter near Rock Gap. At dusk, two girls roll in to camp with their dogs and have been hiking for three days. Scott gets sick on their brownies and nearly killed by a falling tree limb – but we give them a ride in to Franklin the following day (with the windows cracked). Hikers: Charlie Brady & Family, Steve Goodrich & Family, Ken Knight & Family. Noteable Events: We opt for a cabin on top of a mountain near Wesser, N.C. and have a righteous fire next to a hot tub. 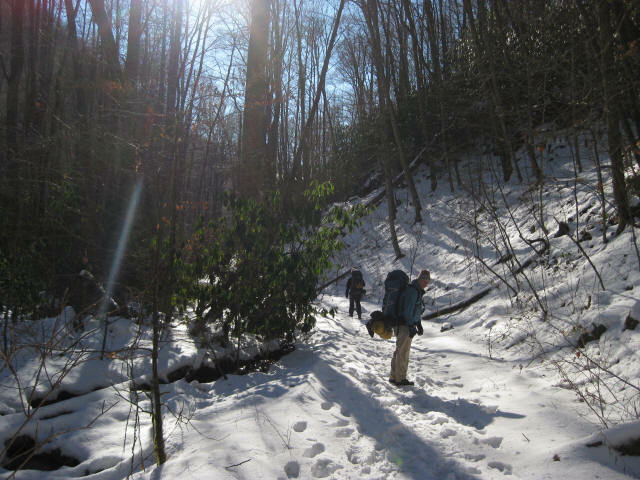 It’s extremely cold overnight but warms up enough to do some day-hiking in the Smokies on New Years Day. Ashley and I pack both kids on our back and Maddie makes her Klondike hike debut at the age of 1 1/2. 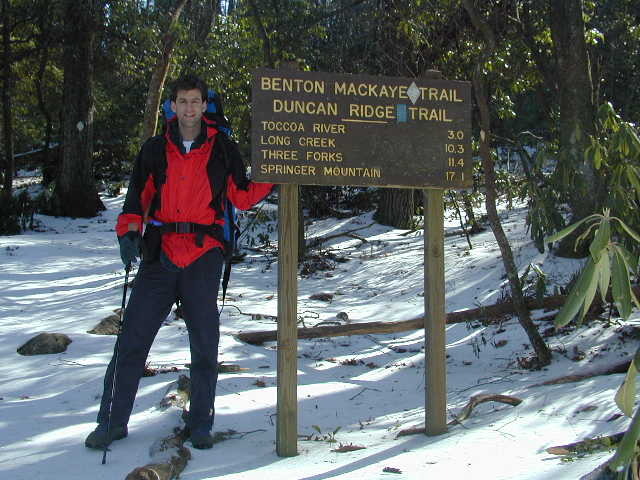 In 2009, I broke from the Georgia Tech pack – opting for fewer miles and less elevation change on these winter excursions. You can follow this link for a look at their adventures which continue to this day. Notable Events: We arrive in Cherokee in time to seek accommadations at the Harrah’s Hotel & Casino but it is booked solid. Moelich promptly loses $60 in 15 minutes and the 60+ chain-smoking crowd sends us scrambling for the Econo Lodge where we take up residence for the night. The next day we have to park on US 441 and hike a mile to Smokemont Campground to start our hike. McKinney and I drop a vehicle at Newfound Gap and take a short cut on the Bradley Fork Trail to close the gap on the rest of the group who use the Chasteen Creek Trail. Not only do we close the gap, but we gain 50 minutes on them and they are surprised to find us at Peck’s Corner Shelter when they arrive. 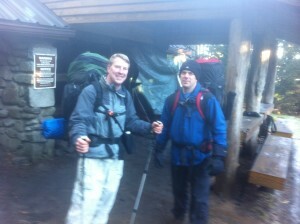 The next day we hike in snow flurries and take a brief break at Charlie’s Bunion. We reach Ice Water Springs Shelter at 2:30pm and warm up to hot drinks. McKinney and I hike out to Newfound Gap by sunset. It snows 2-3″ in the late afternoon and evening. 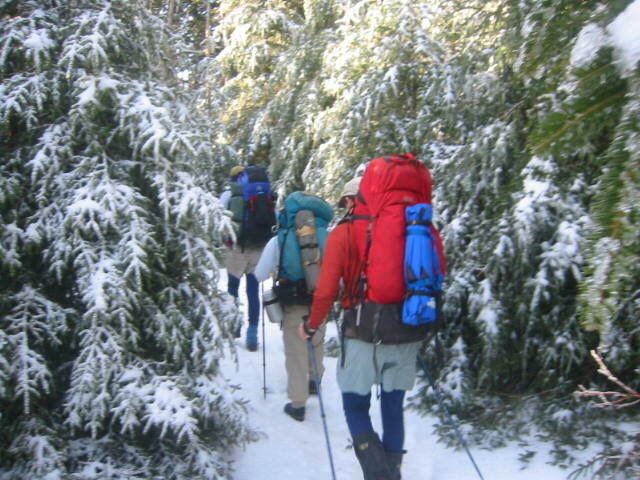 The others stay overnight and hike out the next day via the Dry Sluice Gap Trail to Bradley Fork. Total Mileage 28.8 mi, 14,922′ gain, 14,922′ loss. Notable Events: Porter has a baby due on Monday and misses the annual hike for the first time in many years. We have the traditional Mexican dinner near Buford Highway so that he can see us off. McKinney forgets his insoles and suffers through the trip with sore feet. A front moves in on Day 2 and drops snow on us overnight and during Day 3. The park closes US 441 and is detouring traffic in to Gatlinburg – setting us up for a a 4 1/2 hour detour home. DeLisle has four wheel drive and is waived through the checkpoint. McKinney’s truck has two-wheel drive, but we flash four fingers and are also waived through. Thank God. Total Mileage 31.9 mi, 8696′ gain, 9625′ loss. Notable Events: At 10:20 am, we start the hike at Nellie with sunshine and temps in the 50’s. By the time we reach the Sterling Ridge, a front has moved in and pelts us with rain that turns to snow at the Laurel Gap Shelter. The temperature drops over 40 degrees in the next 24 hours as the wind shifts to the northwest. We move the picnic table inside the shelter and Porter loses a bet that it can’t be done. The next morning there is 3-6″ of snow on the ground and it continues to fall all day. The Polls Gap Trail is closed from blowdowns so we follow a road for approximately 11 miles to Balsam Mountain Campground. The weather forces us under the ranger cabin for shelter and it is bitter cold after dark. 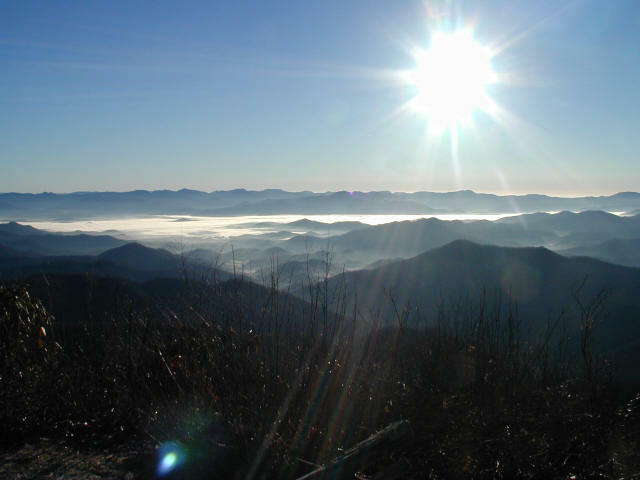 Sunday is clear and we take the Rough Fork Trail down to the Cataloochee area. We stop at an overlook on the drive out and a friendly ranger rolls in to the parking area. He informs us that we are locked in the park due to the storm and escorts us to the gate to let us out. Total Mileage ~ 31 mi, 15,000′ gain, 15,000′ loss. Notable Events: The majority of the group starts Day #1 at the Husky Gap Trail and hikes up to the Mt. Collins Shelter. Tucker and Hayes break from the pack per park regulations and start at a different trailhead (which gives them an extra mile this morning). The snow line begins around 4400 feet and we have it for the final four miles to the shelter. 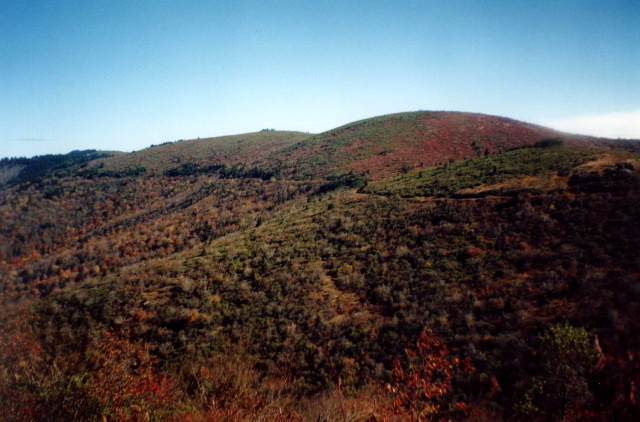 Hayes decides to bail on Day #2, and Tucker follows him back down the Sugarland Mountain Trail. The rest of us hike a mixture of the A.T. and the road down to Newfound Gap and enjoy the beers we stashed Thursday night while crossing the Trail en route to Gatlinburg. Many tourists line the parking lot and the Appalachian Trail and it’s nice to break away on the Boulevard Trail and get some peace. There is 4-8 inches of snow along ridge and it’s slow going above 4400 feet. 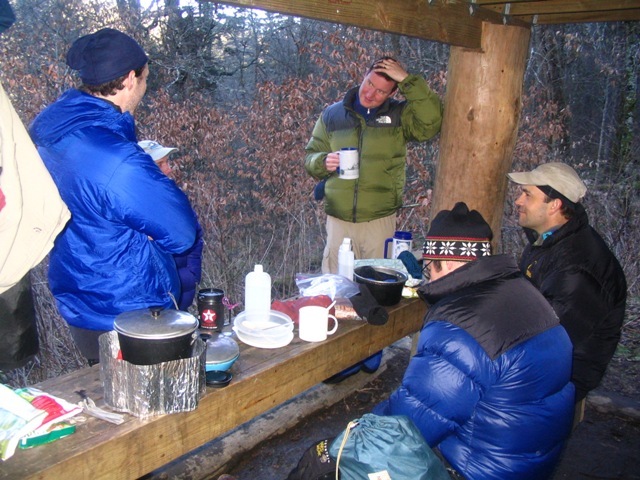 We spend a cold night at the LeConte shelter with three guys from Kentucky, and Ewing briefly “borrows” their insulated down boots while they are out. On Day #3, he hikes the 10+ mile route out with DeLisle and Porter while the rest of us sleep in and take the icy – yet much shorter – Alum Cave Trail to U.S. 441. We hitchhike to the Sugarland’s Visitor Center and see a bunch of wild turkey in a meadow. This with the bobcat and fox sightings on the drive in make for a solid wildlife experience this trip. Total Mileage ~ 33 mi, 14,200′ gain, 14,700′ loss. Notable Events: Had a job interview with EarthLink on Monday (MLK day), so drove the Pathfinder to Waynesville, N.C. to meet the crew with plans to bail on Sunday. McKinney caught a ride with me and ended up sticking to my itinerary. Hiked nearly 4000 feet on Day 1 crossing Mt. Sterling – which had snow on the 5820′ summit. Tried to get #3 Wake v’s #2 Duke on the radio during the hike but had no luck (and we lost the game anyway). It started to rain within a mile of Laurel Gap Shelter, then continued to rain through mid-afternoon on Sunday. On Day 2, the Boyz got 2-3″ of snow while hiking the A.T. to Cosby Knob Shelter while McKinney and I got drenched on our hike down the Gunter Fork Trail. Both McKinney and I fell in to Big Creek while fording the stream, got soaked, and were very happy to reach the truck around 3pm. Stopped at Mountain Mama’s Kuntry Kitchen on the drive home for some eats – but it is no longer in operation. Bummer – once a great stop! Total Mileage (MLK guys) 33.4 mi, 16,700 gain, 16,700 loss. Notable Events: Road with Porter, Brunn, and Moehlich to Fontana, NC then had some beers and played Ewing’s throw-back Colleco Football game late night while Brunn finished packing around 1am at the motel. Day 1 we hiked the LakeShore Trail past some vintage (and rusting) early 1900’s cars, then discovered an awesome campsite at #90. Hiked past it to stealth camp on a slope in Porter’s Mega-mid for the night. It was so cold that Ewing cracked his tooth on frozen candy. Joe planned to hike in and join us tonight – but was a no show due to work. On Day 2, we climbed to the A.T. then hiked southbound to Mollie’s Ridge Shelter and walked across some hard packed ice in the last two miles. Day 3, we logged a double digit day and climbed Gregory Bald – the highlight of the trip – and spent two hours on the summit. The others took a detour on the A.T. and were waiting at Twentymile with chips and beers when we arrived. Total Mileage 38.7 mi, 12,400′ gain, 12,900′ loss. Notable Events: This was my first backpacking trip after lasik surgery and it was nice to wake up in the backcountry and not need contacts for a change. Day 1 we hiked the A.T. from Wayah Bald to Wesser Bald Shelter and I managed to get a fire going tonight despite everyone’s doubts. Day 2 we hiked 15 miles down to the NOC for lunch then climbed Cheoah Bald. The lengthy climb (and 50+ lb backpack) had me roll in to camp after dark. Tracked the final mile on a new Garmin GPS and correctly calculated a post dusk arrival. Day 3 we hiked the Bartram Trail and followed a stream five miles down to the road. Arrived solo in the wrong location but so did half the remaining group. Radioed Ewing and Moehlich to come get us. Total Mileage 34.6 mi, 8766′ gain, 12,114′ loss. 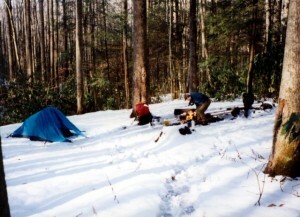 In 2002, I joined up with some guys from Georgia Tech to continue these winter backpacking trips in Western North Carolina – albeit at a much higher intensity level. 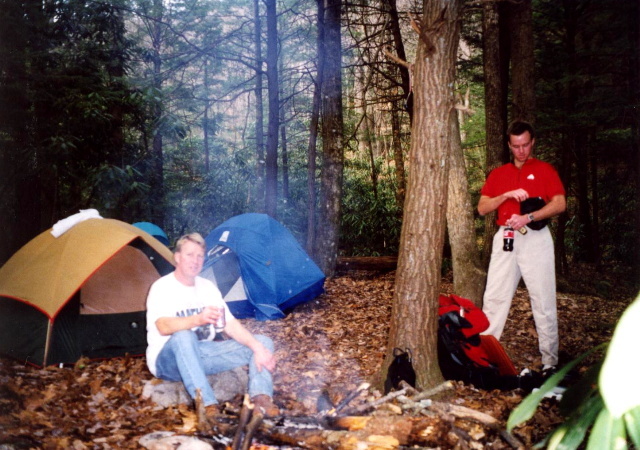 Many of these guys had thru-hiked the Appalachian Trail in the 1990’s, and I had met two of them on the A.T. in 1994. You can follow this link for a look at their winter adventures which continue to this day. Noteable Events: This is Charlie’s first of many backpacking trips. Temps in the low teens are off-set by three hours of firewood collection and a raging inferno that flattens my Thermarest. 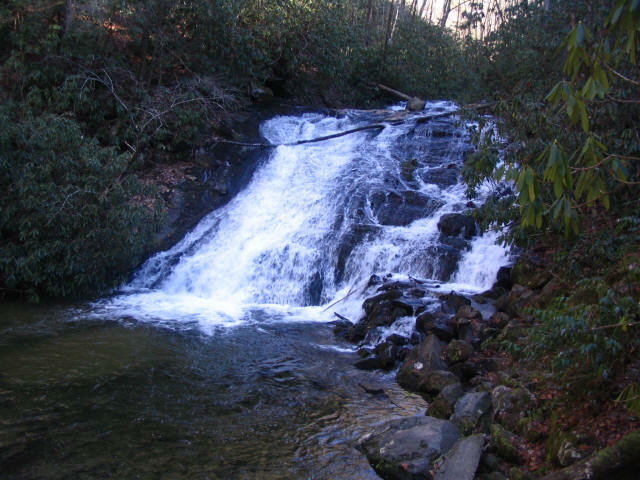 We hike a loop using the Foothills Trail starting and ending at the scenic Whitewater Falls. Noteable Events: A slick layer of ice covers a few inches of snow and Zedd’s crampons pay dividends for him on the trail. We arrive at the Toccoa River to find another backpacker camping in these frigid temps but are unable to get a fire going and end up sacking out early. Total Mileage 5.6 mi, 1117’ gain, 973′ loss. Noteable Events: We hike a loop through the park, have stellar views from a suspension bridge over Raven Cliff Falls, then cross a cable to find a nice site by a stream. The State Park bans backcountry campfires shortly after our trip. It takes us 1 1/2 hours to hike out of the gorge, then Sikle jogs between trailheads to retrieve our truck. Total Mileage 8.6 mi, 3607’ gain, 3428′ loss. Noteable Events: There’s so much snow on the ground that Snyder and I completely miss our designated campsite on the first night. We backtrack, find it, then spend an hour digging out the fire ring and getting wood for the night. 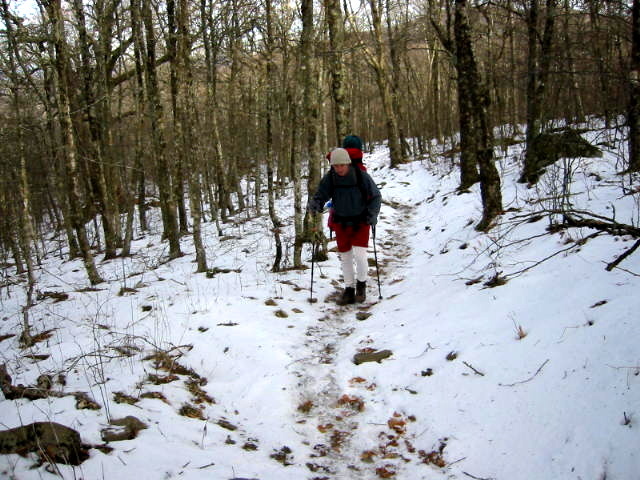 The next day, we labor through knee deep snow on the ridges, take turns breaking trail, and hike less than a mile an hour on the Hughes Ridge Trail. We camp at campsite #49 on the second night then return to Smokemont the following day. Total Mileage 16.6 mi, 7543’ gain, 7543′ loss. Noteable Events: We arrive to find the Blue Ridge Parkway is closed to Graveyard Fields and end up hiking to Shining Rock via Big East Fork. Despite hiking next to water most of the day, we climb the ridge and can’t find a drop. With darkness looming and light rain falling, Snyder and I find a mud puddle (with a boot print in it) and use my water filter until it breaks. We salvage enough water for dinner and sip whiskey as light mist pelts us on a high ridge. The next morning, I am forced to put my contacts in with iodine water when I realize I forgot saline solution – and damn it hurts. Total Mileage 7.8 mi, 2971’ gain, 2971′ loss.